It seems like there are new crossover models on the market every day, but both the Nissan Rogue and the Kia Soul have been around the block a few times. Find out how these two industry veterans compare with our 2019 Kia Soul vs 2019 Nissan Rogue comparison. We’ll take an in-depth look at both models as we show you that not only are they similar enough to compare but that the Kia Soul actually pulls out well ahead of the Rogue in terms of affordability, efficiency, features, and even power. 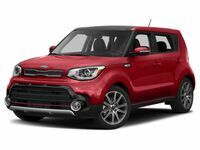 If you already want to learn more about the Kia Soul, then why not check out our new Soul inventory here in Puyallup by clicking the link below. Otherwise, you can check our work and read below to see just how much better the Soul is than the Rogue. Prepare to be impressed. Which is better: Soul or Rogue? If you think it’s unfair to compare these two crossover models as the Rogue seems like a larger model, then remember that both models can seat 5 passengers. In fact, the Soul is only slightly smaller on the inside when it comes to passenger volume as it provides 101 cubic-feet of room compared to the Rogue with 106 cubic-feet. Does that additional size make up for the heftier price tag of the Rogue? We didn't think so. The Rogue also doesn’t beat the Soul when it comes to power. That’s because the Rogue uses the same engine throughout its entire 2019 lineup. The Soul employs three different engines so that you can find your perfect balance between power and efficiency. Interestingly enough, though you do get the max efficiency figure with the base Soul, you also get it with the top Soul Exclaim and that includes the 201 horsepower turbo engine. In other words, the top Soul Exclaim gives you over 30 more horsepower, better highway efficiency, and it’s still almost $2,000 more affordable than the base model Rogue. In the end, the Nissan Rogue even falls short in terms of its warranty. The Kia Soul promises reliability with a 10-year or 100,000-mile powertrain warranty and a 5-year or 60,000-mile bumper-to-bumper warranty. The Rogue only gives you 5 years or 60,000 miles of powertrain coverage and just over half that for bumper-to-bumper coverage. What model would you rather be driving in three years or even five years?